This past summer, I was invited to be the keynote speaker for the Western Region Family Peer Support Retreat in Batavia, New York. This is an annual staff development event for NYS social workers, mental health workers, teachers, caregivers, family members, and others who work with children and families. The focus of the event was on helping parents and children in families with mental health challenges. First, I gave a short talk about The Wish Horse, and then I screened the film. After the film, we broke the participants up into groups. Each group was assigned a character from the film. For each character, the participants identified the following: strengths, needs, action steps, and who's involved. 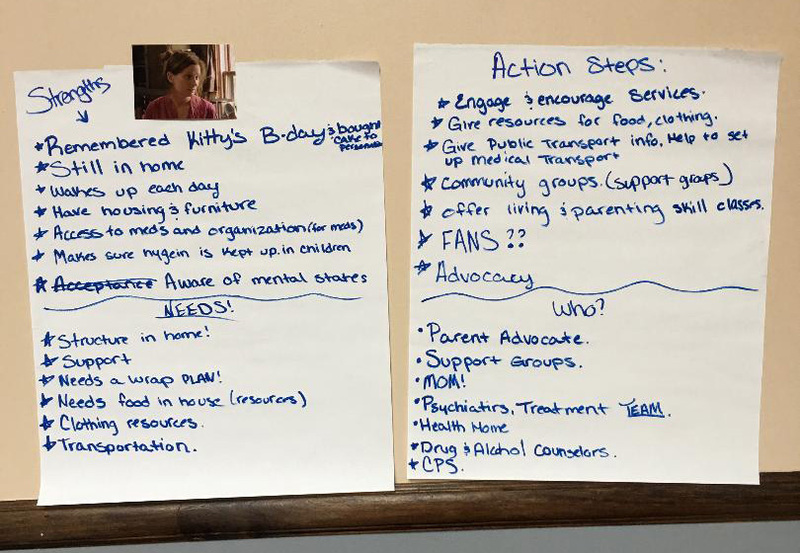 After finishing the activity, the groups reported their work out to the entire audience and discussed practical ideas for working with families. Watching the participants work through this activity was a truly inspiring learning experience for me! Also, the process gave me some great ideas for future workshops. Below is a photo of one of the worksheets from the retreat. This group was assigned to discuss the mother in The Wish Horse family. The Australian COPMI (Children of Parents with Mental Illness) site has a series of videos for young people about mental illness, along with lots of other resources. We shot the film in early spring to capture the muted grays, greens, browns, and blues of Central New York in May. When brighter colors (like the pinks in a character’s costume or pink flowers) appear, they stand out, representing the life and hope of spring. The golden light in the final scenes represents my own wishes for the characters. I’m thankful to our cinematographer, Zack Wilson, and to the rest of our team, for helping us develop the “look” of The Wish Horse. Early on in the process, my sister Sara Smith painted concept art for me. Here’s a postcard we made with Sara’s artwork. When I screen the film at festivals, I'm usually approached by audience members after the screening -- often the adult children of parents with mental illness. For example, at our Katra Film Series screening in NYC, a woman came up to me after the screening and said, "Thank you! I've never seen my story on the screen before."